Stephen imagines the milkwoman as being a humble avatar, "the lowly form of an immortal." His phrase "poor old woman" recalls the Shan Van Vocht of Irish mythology. But the thought that she is "maybe a messenger" invokes Homeric divinity, likening the old woman to Athena, who twice appears to Telemachus in the form of an old man to tell him what to do. In Book 1 of the Odyssey, the goddess Pallas Athena resolves (in Robert Fitzgerald’s transation) to “visit Ithaka / to put more courage in the son,” and to urge him to take certain measures to oppose the suitors and find news of his father. 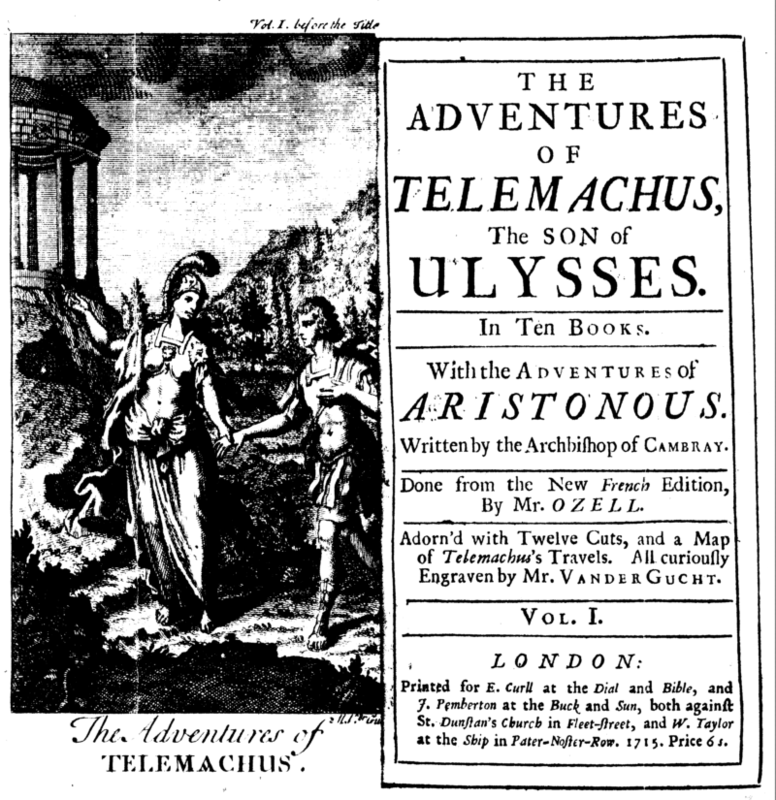 She visits Telemachus disguised as an old “family friend, the Taphian captain, Mentes.” Telemachus sees through the disguise, however; as Mentes leaves the palace, he “marvelled to himself / divining that a god had been his guest.” In Book 2 Athena returns in a new disguise as Mentor, “comrade in arms of the prince Odysseus, an old man now,” whom Odysseus left in charge of the palace. Telemachus has been praying to the “god of yesterday, / guest in our house” to help him, and Mentor suddenly appears. Joyce imitates this numinous appearance, and has Stephen think that the milkwoman may be coming “To serve or to upbraid” him. But Stephen departs from the Homeric original in “scorn[ing] to beg her favour.” This skewing of the Homeric analogue will continue in Nestor: Mr. Deasy corresponds to the old warrior Nestor whom Telemachus consults for news of his father, but Stephen does not feel that he has anything to learn from the crusty old man. Frontispiece and title page of The Adventures of Telemachus, the Son of Ulysses, by the Archbishop of Cambray (1715). Source: originalliterature.wordpress.com.